Westworld is a Wild West-themed?sci-fi series that’s sure to leave you craving for more. Find out how you can get up to speed with one of the most talked-about series in town! Westworld is an American science fiction Western television series created by Jonathan Nolan and Lisa Joy for premium cable provider HBO. It centers around Westworld, a fictional and technologically advanced amusement park that is based on the Wild West. This park is populated by androids. These androids serve as “hosts” to wealthy human guests who may indulge in their wildest fantasies within the park. Nothing they do in the park is punishable by law since these androids can always be fixed up after being killed. The first season of the series was broadcast on HBO between October 2 to December 4, 2016, and saw high ratings and reviews. It was renewed by HBO for a third season on May 1, 2018. You can watch Westworld on Sundays at 9/8 c on HBO. If you’re not subscribed to a premium cable provider or HBO is unavailable in your area, don’t worry. 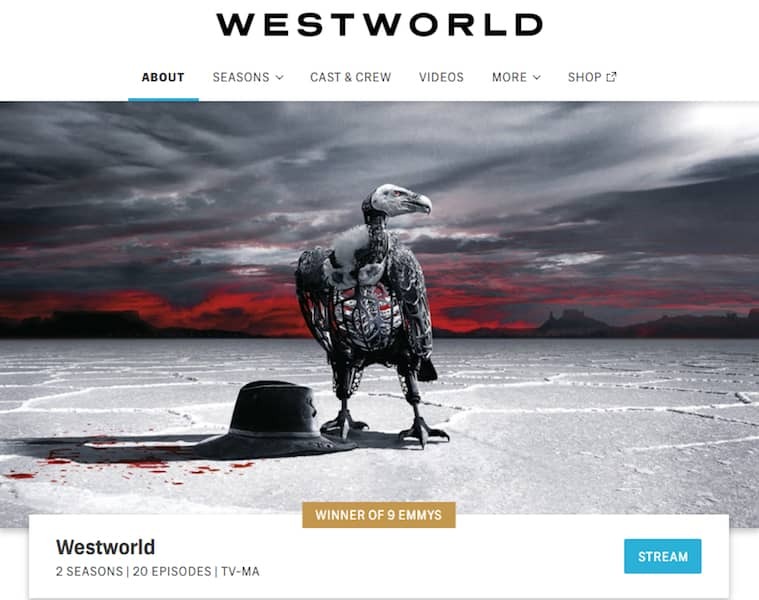 Scroll down below to find out the official and unofficial ways to stream Westworld online. If you’re currently subscribed to HBO, then it’s very likely that you’re also subscribed to their premium streaming service, HBO Now. If you haven’t, do yourself a favor and subscribe. You don’t need a cable subscription to get HBO Now. Why? 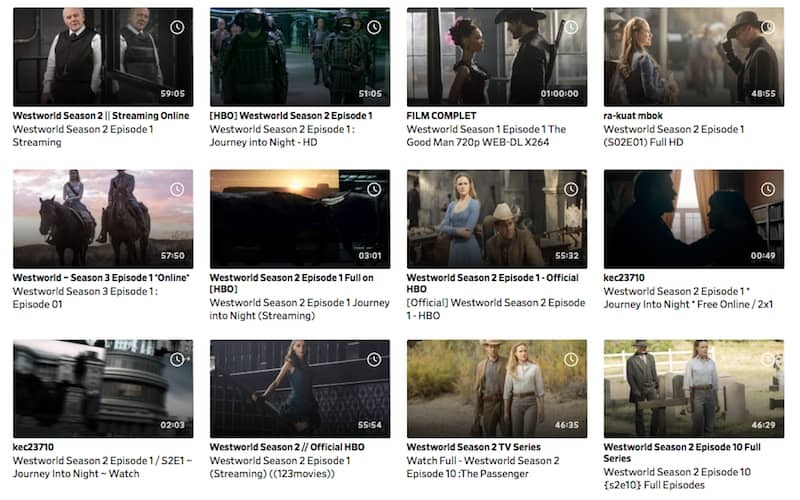 HBO makes all 20 episodes of Westworld available on its website for streaming. All you have to do sign up, subscribe and watch. Easy-peasy. And if you’re into free stuff, you can try the 7-day free trial. The bad news is this offer is currently limited to U.S. residents. But don’t be sad. You can always learn how to use a VPN to unblock this restriction and watch on HBO as if you’re in the U.S. 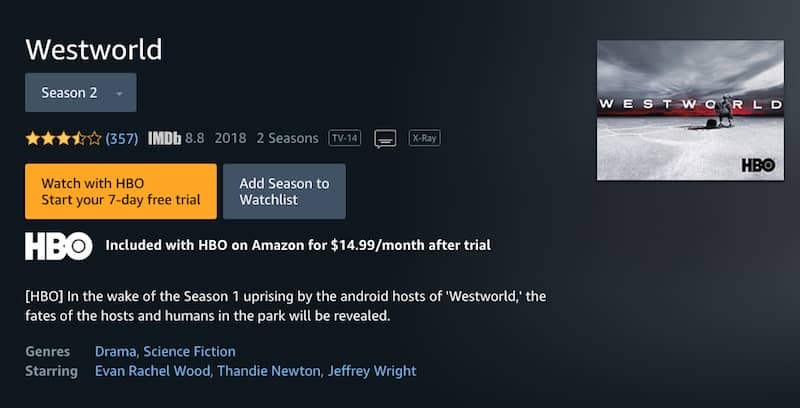 If you don’t have HBO or it’s unavailable in your area, you can watch Westworld on Amazon. If you already have an Amazon Prime account, you’re in luck. Amazon’s partnership with HBO makes the lives of its subscribers easier because you can choose between streaming on your Amazon Prime account or on HBO. That’s 2 full seasons of Westworld goodies up for grabs. And if that’s not good enough, there’s also a 30-day free trial for non-subscribers. However, if you are not a U.S. resident, streaming on HBO will be a problem. As we said earlier, you can use a VPN to bypass this restriction. All you need to do is scroll down below. Another sad thing is that buying individual episodes is not available at the moment. We can only hope that it will be someday. Fingers crossed. If you’re residing in the U.S. but you’re not into either HBO or Amazon, consider Apple iTunes as another alternative. The Apple iTunes app basically does all the work so it’s as good as the others. All 20 episodes of Westworld are available on the app, so just open it, buy the bundles, sit back, and binge-watch. Alternatively, you can also choose to download a number of episodes to watch on your smartphone when you’re on the road. If you’re residing outside the U.S., you can still buy the season 1 and 2 bundles or both – just make a U.S. iTunes account and you’re good. Give the bundle a go if you have the money, as you’re basically getting all episodes of the series including the bonus clips and behind-the-scenes material (saves you more than around $8 and $18 dollars for both SD and HD!). If you want a breather from all the popular streaming services available like Amazon and iTunes, then Vudu is for you. If you haven’t heard of it, it’s an underrated app which also offers the same streaming services as the three previously mentioned. Like iTunes, it also lets you download the episodes so you can basically watch Westworld anywhere, anytime. Pricing is also reasonable compared to other streaming apps, so you’d definitely want to check this one out. If you are looking for alternative streaming services, we got you covered. 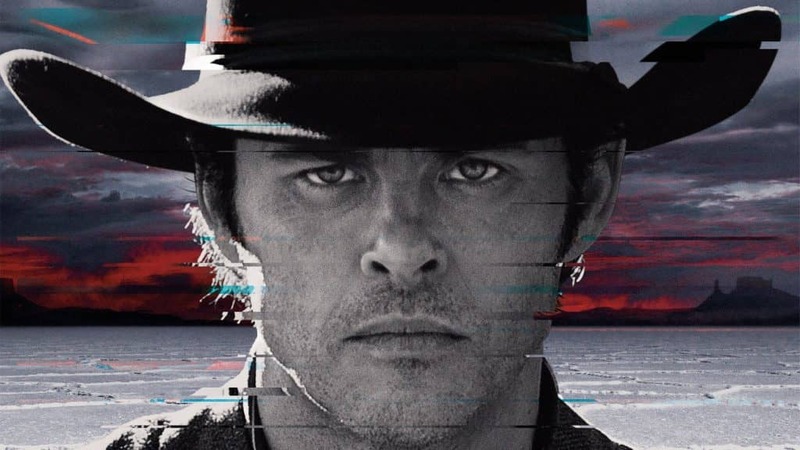 Scroll down below to view our list of unofficial ways to watch Westworld online. Considering the immense popularity of Westworld, YouTube’s definitely a no-go because of its strict copyright infringement policy. And as always, when you can’t find something on YouTube, Dailymotion’s your go-to guy. 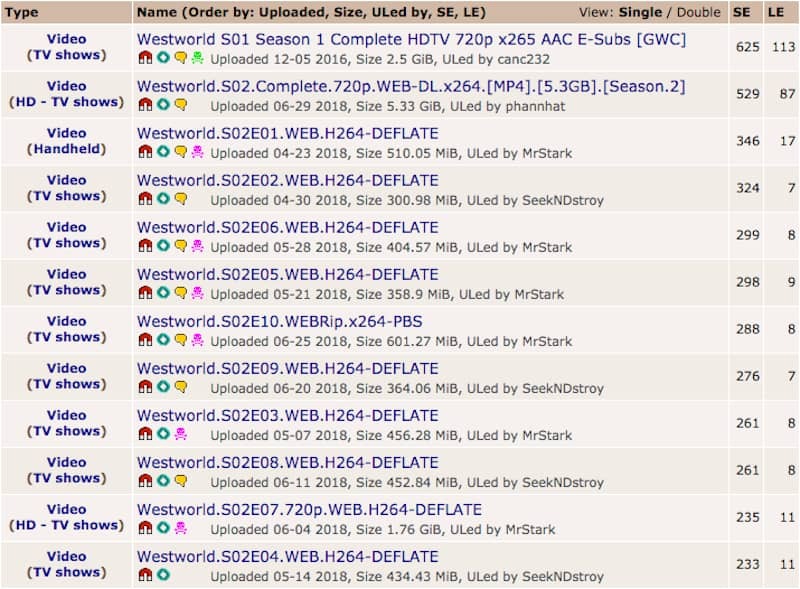 If you’re feeling lucky, try finding an episode of Westworld on the site. You never know if some fellow fan has uploaded the episode you’re looking for. Just remember, you’ll probably clicking a lot of links and clickbait. You’re completely at the mercy of the uploaders on the site so you’re not guaranteed to find the episode you are looking for. Practice patience. If you don’t have the patience for Dailymotion, then try Openloadfreetv. Openloadfreetv is advertised as one of the most recommended sites for people who want to stream popular series or movies. Just go to the site, click on the search bar, type in Westworld, and that’s it. No accounts or registrations needed. It’s that simple. Expect a 30-second to 1-minute ad to play before watching. You also need to be vigilant about testing each link to make sure it’s not broken. If you’ve tried both methods and you’re still left unsatisfied, then just go to Google and search for it. Just type “watch westworld for free” or “how to stream westworld for free” for a list of sites which might offer what you are looking for. But since most of it requires you to click every link you can possibly find, expect that you’ll be dealing with lots of virus and malware which can harm your computer. It’s best to always enable your AdBlocker or subscribe to a premium VPN which offers protection to maximize your browsing experience. And if you’re required to make an account, use a fake email to protect your privacy. Due to the popularity of Westworld, there are lots of people who would want to share or get their hands on it. We do not condone piracy nor the torrenting of copyrighted shows. It might be legal if you already own the episode via a streaming app or online purchase and want to have another copy for some reason, but it’s another thing if you upload it for sharing. And if you open your network for a P2P connection, you risk exposing your identity which can compromise your privacy. To avoid breaking the law and to weed out outsiders from your private network, use a VPN. If you still want to torrent, all we can say is check out our best VPNs for torrenting. If you’re tired of seeing things like “this is unavailable in your region” or “this content is restricted to those residing in the U.S.” then this section will surely help you. If you haven’t heard what a VPN is, then it’s about time you learn how to use it. A VPN is a piece of software which is used to re-route your internet activity around the world, which enables you to access content which is not available in your region like Westworld through a dedicated server. This means that you might appear to be residing in the U.S. but in truth, you’re somewhere else. What’s more appealing is that in addition to that, it also hides your activity so you’re guaranteed to be safe from prying eyes. Check out our two most recommended VPNs for a headstart! If you are itching to watch Westworld, then we recommend that you try our top-rated VPN, ExpressVPN. It has established a good following over the years because of the premium services it offers – high internet speeds, lots of server locations, ability to bypass geo-restrictions, and even torrenting support! It also has 24/7 customer service so your questions can be answered any time of the day. All of these for $8.32/month for a year’s subscription. Think of all the money you’ll save as opposed to purchasing seasons on Amazon Prime or iTunes. No wonder ExpressVPN ranks first whenever people try to search for the best premium VPN in the market. It’s simply the best bargain there is. If you’re just starting out and $8.32 seems a little bit pricey, then we recommend NordVPN as your best alternative. It’s basically the same services as ExpressVPN, minus the 24/7 customer service and the number of server locations. ExpressVPN has servers in 90+ countries, NordVPN in 60+ countries. Both are perfectly respectable options and you likely won’t lack servers for your streaming needs. The best news is that NordVPN offers all this for just $2.99/month for a 3-year plan. If you’re looking f a VPN you can use long-term, this is it. Unblocking Westworld will be such a breeze. With all these recommendations, grab some popcorn and head to your couch! The creators of Westworld have yet to announce the season three premiere date, so you have lots of time to watch all 20 episodes of the series. Don’t forget to always use your VPN to unblock geo-restrictions on streaming sites. Now press play and get ready to meet your favorite hosts for the evening’s entertainment.